While food presentation, or ‘plating’ has long been an important aspect to dining across many cultures, the dawn of the Instagram era has seemingly taken it to another level. These days, dining out can feel like a trip to a tourist landmark. Dishes are carefully documented and curated for the visual satisfaction of virtual diners on social media. However, enhancing the aesthetic appeal of food is not just the domain of chefs in fancy restaurants. Sometimes the humble green-grocer on the corner will take great pride in his produce, and carefully arrange his fruit and veg in a pleasing manner for his customers. Maybe you accidentally made a pancake that arranged itself into a triumph of geometry, or more often than not, Mother Nature was just awesome and produced the sexiest damn onion you have ever seen. We here at Bored Panda have compiled a list of the most gorgeous grub we could find, whether it’s satisfyingly symmetrical or just plain tasty-looking! Scroll down below to check it out! That's a skilled, Barista!! Amazing color, and perfection! Noone obviously dares to buy cherries here, afraid to drop a topple that mountain. "Mommy, when can we eat it?" "Are you INSANE? This is a work of ART!" This needs to get voted higher! Oh my gosh..set up to fail.. Clean up, ALL DAY, of Isle 3!! I'm not a huge fan of pancakes, but I need these. Don't you mean a grapient? When the bottom one is red, summer is over. Umm.. what you said where your address was? LOL, what is happening in the background? 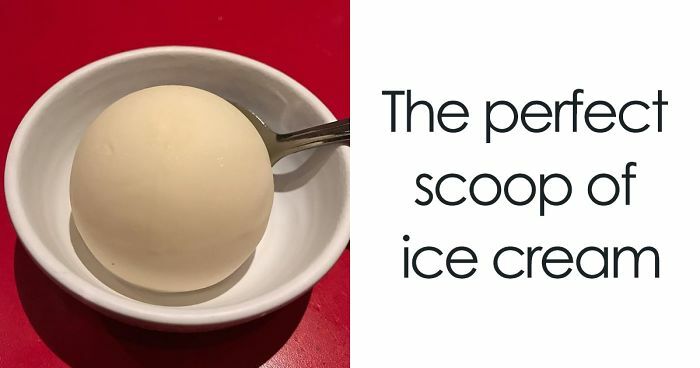 It doesn't fit the diameter of the cone, you got cheated out of ice cream. Delicious but am i the only one who would think this would be better of they were burnt on the out side? Why do I feel this would make a great popsicle? Am I the only one that whenever I buy tic tacs I'll shake the container until all fit that way? I thought this was salmon sashimi at first!